The Pharcyde was (yes; past tense) a group consisting of four members who each came up with probably the stupidest names imaginable: Imani, Slimkid3, Bootie Brown, and Fatlip. No; I'm serious; those were their names. Do not be fooled by the comical nature of their stage monikers, though; The Pharcyde was an incredible group. The Pharcyde released two albums as a group: Bizarre Ride II The Pharcyde in 1992 and Labcabincalifornia in 1995. Both projects were critically acclaimed, their debut '92 album considered by many to be one of the best hip-hop records ever released. Shortly after Labcabincalifornia, Fatlip left the group due to some conflict with the other members. The remaining three members of The Pharcyde then went on to release Plain Rap in 2000, but, to be honest, no one really cared. After Plain Rap, Slimkid3 removed himself from The Pharcyde to pursue solo ventures. Then, in 2004, Imani and Bootie Brown, the only members remaining from the once great collective, put out Humboldt Beginnings. Once again, nobody gave a damn. Despite the fact that The Pharcyde became somewhat of a joke after its sophomore release, it still managed to stamp its name among rap's greatest groups due to its first two efforts. Now that that's out of the way, let's get to Bizarre Ride II The Pharcyde, the group's first project, and its only project to be certified gold. Except for one track, the album was produced entirely by J-Swift. The album gets off to a good start, as the lead cut is very playful in tone (much like the rest of the project) and is basically a funny song about The Pharcyde's experience with women. I really hope it's fictional, too, especially in the case of Fatlip, who finds out he's dating, well, a man. Anyway, J-Swift's bouncy beat matches the mood nicely. I love this one. J-Swift's drums are fantastic. The lyrics don't really make much sense (actually, some of them are just downright weird), but no one listens to Bizarre Ride II The Pharcyde for mind-blowing lyricism anyway; they do it for the unorthodox (and almost child-like) flow of each of the members and the upbeat nature of the production. This is one of the album's best cuts. J-Swift comes through with another sick beat, this one consisting of horns scattered throughout. The hook on this is damn good. This was always my second favorite song on the album, even if the hook is probably the lamest thing I've ever heard (it's The Pharcyde saying "eeh ah, ooh ah ah," so basically, they're making chimpanzee noises). J-Swift's crazy beat makes up for any corniness the hook may have brought. Listening to Bizarre Ride II The Pharcyde again made me wonder why in the world hardly anyone else asked J-Swift to do any work for them on the boards. His use of drums on "On The DL" is masterful, and the light piano hits throughout make the track that much more enjoyable. Another great record. "Officer" basically tells you everything you shouldn't do while driving. Well, maybe not everything, but a lot. Essentially, the track is about The Pharcyde either driving with suspended licenses, no licenses at all, etc. and then pleading with the cops not to pull them over. The beat is solid. A song based on the classic "yo mama" theme. To be honest, the content is pretty stupid, but the laid-back production from J-Swift is good enough. This was the album's first single. 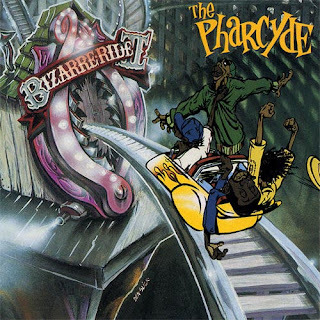 The biggest hit on Bizarre Ride II The Pharcyde and, probably, The Pharcyde's biggest hit in general, although "Runnin'" off of Labcabincalifornia gives it a run for its money. Anyway, this song is really good, if not depressing. Each of The Pharcyde members talks about a woman they want to get with, but due to extenuating circumstances, that is made impossible. J-Swift's instrumental is exceedingly chill and relatively somber, but it sounds phenomenal. "Passin' Me By" is my favorite record on the album. As I'm sure you can infer from the song's title, "Otha Fish" is about not putting all of your eggs into one basket when it comes to females because there are plenty of other ones out there. I like the concept, but I don't like the song. This is the only track on Bizarre Ride II The Pharcyde that was not produced by J-Swift, and it shows, as the beat here just isn't very interesting (it was co-produced by L.A. Jay and Slimkid3). One thing is for sure: The Pharcyde is very blunt (no pun intended) with its song titles. I really don't think I need to tell you what this song is about (even though I pretty much already did by saying "no pun intended" after the word "blunt"), but what I will say is that I really dig J-Swift's production. This track really sounds like it should have been a single, but it wasn't. J-Swift's beat is insane, and even though it's the type of instrumental that would overpower the vocals of some rappers, The Pharcyde unsurprisingly sound more than comfortable over it. This is one of my favorite joints off of Bizarre Ride II The Pharcyde. Beautiful way to end the album. If you're looking for an album that will deal with serious matters, then Bizarre Ride II The Pharcyde, for the most part, is not for you. As I stated earlier, the album possesses a very playful and happy-go-lucky vibe (except for "Passin' Me By"), and the overall focus is clearly more on the production and the group's delivery rather than lyrical dexterity. Labcabincalifornia is certainly more serious in tone, so maybe you should listen to that project if that's what you're into. Anyway, I wouldn't place Bizarre Ride II The Pharcyde among my favorite albums, but that doesn't mean I don't like it. The Pharcyde's debut represents a nice change of pace from a lot of the other rap records out there that delve into much more complicated issues, so it definitely has its place in hip-hop. It paints a rather vibrant picture of daily life, and that's always a good thing. While a lot of the beats sound very similar on here, they are pieced together very nicely, and J-Swift is able to give every instrumental its own unique quality even if it sounds a lot like the track that was played just before it. There are also numerous skits on Bizarre Ride II The Pharcyde (five, to be exact), so they act as sort of a buffer for the beats. I think one would deem it pretty clear after listening to this album that it would not hold up very well in today's market. You just don't see this type of style in hip-hop nowadays, and because of that, Bizarre Ride II The Pharcyde would likely be shunned by fans of the newer generation of rap artists. That doesn't make it any less stellar, though. I'll conclude by stating that I liked Bizarre Ride II The Pharcyde. I did not love it, but I do think it carries some replay value and will probably always receive at least a bit of rotation on my iPod. I will say, though, that "Passin' Me By" is a favorite of mine.